The MX480 ESR provides a dense, highly redundant platform primarily targeted for dense dedicated access aggregation and provider edge services in medium and large Points of Presence (POPs). The MX480 offers common hardware redundancy including the Switch Control Board, Routing Engines, fan trays and power supplies. We buy and sell used Juniper networking equipment. 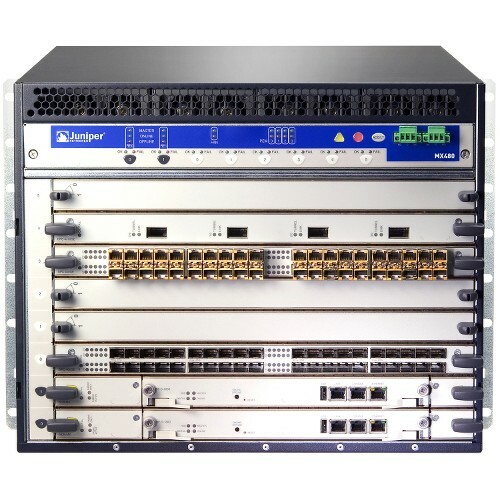 Please contact us to buy or sell any pre-owned or used surplus Juniper routers. Used Juniper MX480 routers are designed with specifications suited for a wide range of networking applications, including cloud, campus, enterprise, service provider, cable and mobile. Although it’s only the second most-powerful MX Series modular router, it’s substantially more powerful than the entry-level modular router. But it’s also nearly twice as big, requiring more space in networking facilities. Used Juniper MX480 routers are a scalable and powerful routing solution. 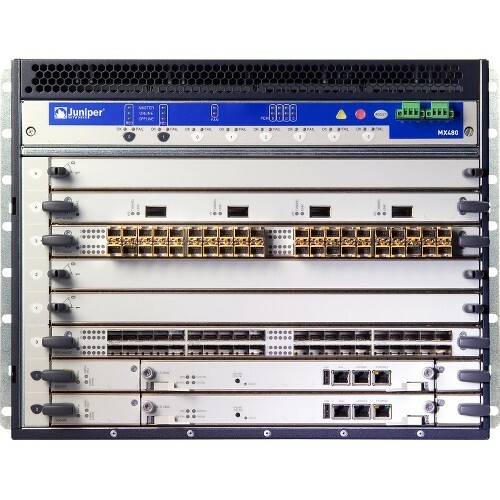 At 8 rack units (RU), it offers more flexibility than the entry-level modular MX Series router, the MX240, because it has three times the number Modular Port Concentrator (MPC) slots. MPC slots are able to hold multiple Modular Interface Cards (MIC), which determine the quantity and types of ports that are available. The MX480 supports 6 MPCs, whereas the MX240 supports only 2 MPCs. Every specification on Juniper MX480 routers is essentially three times stronger than on MX240 routers. The MX480 supports three times the number of total 1G, 10G, 40G and 100G Ethernet ports. It also has a maximum capacity of 5.76 Tbps, which is three times greater than the maximum capacity on the MX240. The MX480, however, requires a larger frame in order to support its more advanced specifications. You can see in the chart below how exactly pre-owned MX480 routers stack up against the similarly designed MX240 and MX960 routers. If you are interested in reviewing more in-depth specifications for MX480 routers, please reach out to us. We can supply PDF datasheets that will allow you to compare in detail used Juniper MX480 routers with other modular MX Series routers. We’ll purchase your used surplus MX480 routers in bulk, as long as they meet our performance standards. BrightStar Systems has been in business for more than 20 years. During that time, we’ve built a global logistical network that keeps our shipping and packaging costs down. This system is favorable to sellers. 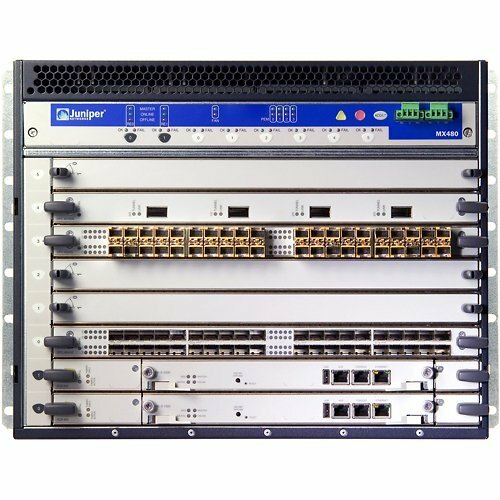 When you sell your pre-owned Juniper M480 routers to us, we’ll offer the best purchase price possible. You can put those earnings toward replacement equipment or into another part of your operation. If you’re unsure whether or not some of your used Juniper hardware is operating properly, we’ll verify it at not cost using our testing process. If you have pre-owned MX480 routers you’d like to sell, please contact our sales team and we’ll get the process underway. Every pre-owned Juniper MX480 router we sell is guaranteed to work right out of the box. We’ve developed a comprehensive and reliable 9-Point Quality Control and Testing Process that assesses several conditional factors, including physical damage, power supply functionality, physical port performance and more. To make sure you receive your pre-owned Juniper MX480 routers safely and securely, we use only the highest quality packaging materials. And no matter where in the world you’re located, we can get you the used Juniper hardware you need at a cost-effective price. For more information on our in-stock pre-owned MX480 routers, please contact us and we’ll put you in touch with one of our sales associates. At BrightStar Systems, we structure our prices around the particular products you’re looking to buy or sell. In order make sure you receive the best rates, we ask you to send us in writing which used surplus Juniper products you’re interested in buying or selling, and we will respond with an offer for your equipment or a quote for the hardware you’d like to purchase. Once we’ve verified the list of items that make up the order, we’ll settle on a price and move forward with the payment process. When you sell us products, we’ll provide you with our shipping account information for billing purposes. If it’s a large shipment, we can schedule a freight pickup for you. And when we purchase products from you, we can pay in advance, or cut a check once we’ve confirmed all the equipment meets our operational standards. We purchase used Juniper MX480 routers from Fortune 500 companies and service providers in bulk. We’re also an independent stocking dealer of pre-owned Juniper equipment, which keeps our prices down and allows us to offer you better prices for your equipment than online retailers and other competitors. You also won’t find better customer service anywhere else. Our team is comprised of experienced networking professionals that know all the products and parts we sell inside and out. We’re here to answer any questions you have before buying or selling equipment, and we’ll help you setup and install any products you purchase once they arrive. Contact us today if you’re looking to buy or sell your pre-owned Juniper MX480 routers, or any other used Juniper MX Series hardware. Our sales team will walk you through the entire process from start to finish. Read more about Juniper MX480 specs with our downloadable PDF datasheet. Contact us about used MX480 routers with BrightStar Systems’ 1-Year In-House Warranty.